With 32 award nominations and 24 wins, I think its safe to say that the actress, film and music video director of dual Kenyan and Mexican citizenship, Lupita Nyong’o, has won not only the hearts of Hollywood but also millions of people across the globe including myself. Her continue rise in Hollywood coupled with the pious and elegance she exudes while gracing magazine covers or on the red carpet is also a delight to watch. Aside from her remarkable performance in ’12 Years a Slave’, where she played ‘Patsey’, what has however kept me rather glued to my television or laptop screen the last couple of months has been her acceptance speeches. Watching Lupita deliver these heart-felt speeches with great eloquence, passion and laced with just about the right amount of humorous anecdotes about some of her life experiences that often lingers in one’s mind long after the speech has been my personal favourite and the highlight of this award season for me. My love for her beautifully crafted oratory has led me to write this post. Below are videos of some her acceptance speeches and I hope you find them as mesmerising as I did. 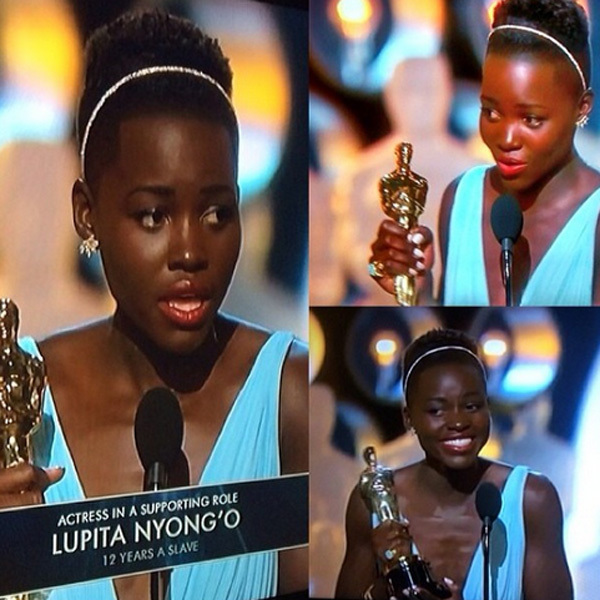 Congratulations Lupita and hope to see you more on our screens doing what you know how to do best!